The functional ecology and mechanical properties of hooks in nature is a vast subject area – too large to be encapsulated in a single thesis. For this reason this investigation has been developed as a foundation paper for instructing further work in this field. From an evolutionary perspective, a hook shape is a fundamental shape which has existed for millions of years, first seen in fossils from the Cambrian age. There are a finite number of biological materials that grow into hook shapes. Any environmental influences and changes are facilitated by the initial self-assembly of molecules during growth at a cellular level, when the structural materials are manufactured. A study of a biological structure can be separated into parts. First there is the study of shape, then the material properties and finally the modelling of the structure’s behaviour in concert with its substrate. Thereafter appropriate artificial materials are selected and a prototype device is manufactured. Five specimens of three biomaterials were selected and three types of experimental procedures are conducted upon them. The following structures were studied: plant hooks composed of cellulose, bird claws composed of avian keratin and insect hooks composed of insect cuticle. Discussion then proceeds to the design value that could be derived from each. Appendices to this report include biomaterials, a zoological database of examples and a description of the progress and utility of recording biological morphologies. The behaviour of biological structures and the implications of the principle of adaptive growth and its applications to engineering design. The application of the study of insect/tarsus/plant surface interactions to pest control and miniaturised robotic feet is discussed. It is proposed to continue this research into developing a prototype robot based upon the morphology of an ant with the ambition of creating a robot that can walk up a vertical surface. Some may say that I have cast too wide a net in preparation of continuing my research. I personally feel that this was necessary in order to fully appreciate and understand the topic area as well as possible. There are two ways of learning chess: studying a single attacking strategy in the hope that it works first time, or learn the rules of the game and after consolidation, utilizing the knowledge with confidence. This report is my consolidation. The Journal of Bionics Engineering, Vol. 1 No. 1, 1-3 contains, an opening paper entitled “Significance and Progress of Bionics” by Yongxiang Lu [‎1]. In his paper Yu asserts that many structures in nature have been shape optimized including “the macroscopic and microcosmic structure” of organisms and their configuration and function. This follows from the theory of adaptive growth, that elastic biomaterials are able to increase and discard material in accordance with the stresses applied to them. Bionics of micro and nanometer structure and system driven by the development of molecular biology and systems biology, nanometer technology, and MEMS technology. (1) Bionics of intelligence, cognizance, sustainable economy, and management progress thanks to the development of network, intelligentization (sic) in the information technology and neural growth biology. (2) Bionics of process and bionics of energy owing to the increasingly attention for the people to the environment protection. This is a verbatim quote, grammatical anomalies included. The first is, in part, the main goal of this thesis. This is a secondary goal of this paper on hook-shaped biological structures and hopefully something of this nature will derive from further work. However I have concluded that pure biomimetics is not an easy subject to utilize. It is believed, in fact, that it is far easier to use conventional engineering to solve a problem than it is to approach biology directly in search of a successful idea. Biomimetics is easy to understand and difficult to implement successfully without sufficient knowledge to recognize that which one is observing. Searching for a solution for a problem is the wrong approach. One needs to see what is before one and how it can best be applied and where. The appendices are, it is now realized, the opening chapters to this report and they can be read before the experimental description and hypothesis. For directness it is preferred to keep this, the main body of the report which contains the results and the discussion of the experimentation, separate as this enables the knowledgeable reader to “plunge” straight into the work. Each appendix is written to be complete in its own right but it is believed that further reading will enable their content to be augmented and improved. The requirements of biomimetics as a cross-disciplinary research topic are reflected by the topics of these appendices. Further, the introduction to each experiment directs the reader to the appropriate appendices for referral. For the author, this Phd was an opportunity to augment his engineering knowledge with that of a new science, biology and to combine the two. Thereafter it would be possible to utilize the knowledge over and over again and furthermore, to pass this knowledge on to others. This paper has become the book that would have accompanied this proposal. Structural (tensile) testing in laboratory conditions. Specimens of five individual species, three different biomaterials and three types of hook have been examined. None of these specimens was used consistently in all three experiments. This could be viewed as unfortunate since this would have been suitable for illustrating the complete biomimetic design process yielding a single product. However as stated above, product design through searching for a solution to a prescribed problem is not the correct approach. Instead the view was taken of understanding the field and of consolidating and developing better means of studying hooked structures and small attachment mechanisms, as well as identifying fields of utility, one of which (in the long term) is pest control and another of which is small robotic attachment devices (robot feet!). Further, since all biological materials are composites with demonstrating anisotropic behaviour, in order to make use of the shape optimized benefits of a biological structure one concludes that only artificial composite materials that can mimic the behaviour of these composites are suitable. Note that a master of the field of micro-biological structures and biomimetics, Stanislav Gorb of the Max Planck Institute, says that “in the field of micro-fasteners it is parabolic element fasteners and not hooked element fasteners that offer the greatest possibilities in the field of micro-fasteners” [‎3]. This is an important design indicator for fasteners and excludes all but one type of hooked structure which is commented upon in Experiment 3, from Gorb. Experiment 1 relates to the claws of two common British birds, the robin and the thrush. These are examples of macrostructures (>5mm). Combining understanding of the property of adaptive growth (see Appendix 6) and the use of 2-dimensional digitizing, there is a description of a possible utility of bird’s feet and claws to illustrate the biomimetic design process. There also appears to be information that would be of interest to Earth Scientists since claws are well preserved in the fossil record. 2-D digitising is the only experimental technique that was not used with Arctium minus, and so there is a description of the manner in which 2-D digitizing could be used in the process of optimizing the performance of a hooked attachment mechanism, imitating burdock’s hook/substrate interaction. In this way, Arctium minus is used to demonstrate the biomimetic design process through all experimental techniques in this paper: 2D digitizing, 3D imaging and tensile testing. Further experiments are required to complete the study from a biological perspective and these are described in context. These include a proposal for the study of the material properties of the cellulose hooks after methods developed by Gorb. Experiment 2 was an investigation into using imaging techniques to digitize micro-sized hooks (<0.5mm). Given that the first rule of biomimetics is to copy the structure (from the Bath University Biomimetics website) it was decided to attempt to image structures of two different biomaterials to see if they would fluoresce naturally in the laser of the microscope. In this case a burdock hook and the tarsi of a grasshopper and a bee were imaged. From scrutiny of the literature it is clear that the confocal microscope has not been used for this purpose before, directly imaging a biological structure of the order of 200mm. Experiment 3 was an investigation into the tensile testing of a burdock hook, or more generally, a hook made of the plant material cellulose. It served to confirm the assertion of Gorb that in a hook that grows under the principles of adaptive growth the larger the span or radius of a hook, the greater the strength. (see Appendix 4). The biologist starts the process by studying and identifying the structure which demonstrates the property of interest. With reference to hooks this property of interest can be re-defined as the function such as attaching things to clothing, robot feet or structures to pierce or anchor. The material scientist continues the journey by studying the qualities of the biomaterial of which the structure is composed in preparation of seeking the artificial material that will adequately mime the performance characteristics within the system. The engineer continues the process by mathematically modeling the structure’s performance in a form that can be readily understood, analyzed and communicated. Thereafter the logical step is to move onwards to prototyping and this is where the use of computer aided microscopy teamed with rapid prototyping such as demonstrated in Experiment 2 is a powerful resource. The second process, that of the material scientist, is fulfilled, in part, by knowledge of biomaterials, their performance characteristics and how to assess them and this is demonstrated by Gorb in his paper on the Galium aperine fruit. The third step in the process, the modeling of performance characteristics, is also demonstrated in his paper on the Galium aperine fruit as well as in his paper on parabolic fasteners [‎3]. These are all presented in Appendix 4.
its organizational relationship to other structures. To utilize current biological information as it appears in the scientific literature requires understanding of both biological terminology and the defined fields of study and how to apply them in an engineering study. There is always a commonality in all academic fields of study which is language and communication. It is both the unifier and the divider. The association between biology and engineering is less obscure than it may at first appear to a layperson. A selection of manufactured products can be grouped, differentiated and described in the same way as a group of similar biological structures can be taxonomically defined and indeed this is commonplace in manufacturing systems where efficiencies are enhanced by seeking commonality between parts for materials handling and avoiding redundancies in design. Of course, there is a major difference between biology and manufacturing engineering which is that engineered parts are manufactured to a design and placed within a system of designed parts. Nature’s structures have elements of commonality but their design and assembly is left to natural processes both internal and environmental. From a biomimetic perspective that includes a desire to manufacture, biological information needs to be streamlined down and redefined such that it is useful to the design process, identifying design indicators if the solution is not directly forthcoming from exact replication. The three experiments have been conducted upon five different specimens of three types of hooks of three different biomaterials. This presents a difficulty: presenting the results in a linear manner required for the written page. In actual fact the results and their implications have a matrix-like relationship and so it is inevitable that subjects will be visited and re-visited through the course of this paper. Experiment 1 using 2-D digitising is helpful in illustrating the principle of shape optimization in biomaterials. A paper by C Mattheuk and S Reuss entitled“The Claw of the Tiger: An Assessment of its Mechanical Shape Optimization” [‎6] provides guidance to the principles investigated in this experiment and it is described in detail in Appendix 6. Experiment 3 – The tensile testing of burdock is a form of test that Gorb has already conducted upon five other specimens of hooked plants. (see [‎4] and [‎9]) which are described in detail in Appendix 4). The conclusions of this report suggest applications for further study in the application of biological attachment mechanisms: pest control and insect tarsi/plant strata interactions which form a class of re-usable fasteners, robotic attachment structures. It is Gorb (again) who proposes these avenues with potential in his paper “Miniature attachment systems: exploring biological design principles” [‎2]. He also suggests microsurgical devices and micropart manipulators as possible applications but it should be noted that often small natural structures utilise secondary and tertiary properties. It is recommended that the Appendices be read first by unschooled readers, prior to the experimental work. Alternatively, pertinent appendices to each experiment are cited in each introductory discussion. This is a summary of information from the two prime biological sources ([‎4], [‎9] quoted as reference in many of the scientific papers in this area of research), on attachment mechanisms including images from the text and the web. These texts define attachment mechanisms first in terms of morphology by defining and grouping attachment mechanisms according to their type of attachment and their common mechanism qualities i.e. a permanent attachment functioning as a glue or a temporary attachment functioning like a snap-lock fastener and the by function. Later in this, the body of the report, there is a development of a hypothesis for an alternative method of mathematically classifying hook-shaped structures based upon the component material which, it is hypothesized, could be used in the development of a knowledge-based design decision support system for matching hook shape and performance with artificial composite material. This appendix includes a description of some general material property definitions and an investigation into the structures and properties of cellulose, keratin and insect cuticle because specimens of these three materials were the subjects of the experimental investigations. The plant cell wall is discussed here because of its application to the structure of a trichome, a term used to describe all outgrowths from the plant epidermis. From the perspective of an investigation into the interactions between insects and plant surfaces this is pertinent to the experimentation because the plant epidermis and the trichomes it supports form the substrate with which insect tarsi hooks interact. This appendix has been prepared in anticipation of further research into insect/plant substrate interactions with regard to pest control applications, reusable fasteners and robotic adhesive/climbing structures. This appendix contains detailed descriptions of experimental procedures that have been used in the study of small attachment mechanisms. These have been used in order to guide experimental procedures used in this research. Further they contain valuable experimental guidance, description and discussion that is of importance to research into biological structures. This appendix contains a description of the chronological progression of developments of methods of describing and recording biological shape. It draws upon papers from biology, computing and manufacturing. Imaging is a fast moving field. Here it is small, simple structures that are focused upon as the structures of interest. Adaptive growth is a key generalized assumption in research into biological structures (see [‎1]), that the shape of structures adapt to the applied stresses for reasons of economy. This appendix describes a paper that demonstrates this principle by studying the profile of a tiger and bear claw (both predators) and subjecting the shape to finite element analysis under an extreme loading condition, proving that the profile is shape optimized and that there are no stress concentrations. Further, it shows that the inner and outer curves of the claw follow a logarithmic spiral which has (apparently) long held fascination amongst biologists since the early 1920’s when a renowned biologist named D’Arcy Thomson first discussed this in his book called “On Growth and Form” (as cited by [‎6]). As will be seen from the following, research has shown that it is difficult to isolate the precise reasons why plant hooks are shaped as they are. General trends are identified and efforts are made to develop global rules, thus far without success. The majority of examples of plant hooks are associated with reproduction and the dispersal of seeds and fruits through mechanical interlocking. It is pertinent therefore to consider studies of seed dispersal and their underlying theory. The following derives from “The Ecology of Seed Dispersal” by H F Howe, J Smallwood [‎10]. Is one mode of dispersal preferred over another? Why are there different dispersal structures and is there any benefit of one form over another? What causes the differences i.e. climate, seasons? It states that adaptation is regarded as having evolved through natural selection to enable an organism to reproduce and ultimately survive as a species. It implies a functional configuration and not accidental advantage. With regard to seeds and fruits such as burdock, hooks are termed morphological adaptations but, the paper says, little is known about the selective forces that produce them. There is discussion upon the reasons for dispersal and the different methods, such as the fact that that the family Leguminosae, of which there approximately 17000 species, has seeds that have adapted to be dispersed by birds, bats, rodents, water, fur, feathers, wind, ballistics or simple gravity. The Escape Hypothesis asks if there is a selective advantage to seeds being scattered further from the parent plant. The Colonization Hypothesis says that the goal of dispersal is to find suitable habitats to colonize. Habitats and their conditions change over time and the “goal of the parent plant” is to find another suitable habitat, hence dispersal. The Directed Dispersal Hypothesis says that seeds are taken to non-random places that are suitable for dispersal. This paper continues with a very specific ecological and evolutionary approach which is not very applicable to a work on the mechanical properties and functional ecology of hooks. It may be considered to investigate this aspect of the work further in the future. Experiment 3 later in this report (Section 8) deals specifically with the mechanical properties of burdock, and during collection of the tested specimens precise notes were taken of the positioning of the collected specimens on the plant for possible analysis. However, there has already been an in depth study of the ecology of Arctium minus but it appears that this report has gone missing from the British Library. The discussion now moves to: “Plant Biomechanics – An Engineering Approach to Plant Form and Function” by K J Nicklaus [‎11] and particularly Chapter 10. This describes the evolution of form and function and their relationships. Paleobiology (it says) allows for the development and testing of hypotheses through the study of fossil records and the utilisation of knowledge and principles that are equally applicable today. Paleobiology makes use of a geologic column, a chronological ordering of the ages of the planet. Fossil organisms are recorded chronologically on this column in their order of their appearance in the fossil record and this information is used to attempt to develop or prove hypotheses such as that of natural selection. Darwinian evolution suggests that organisms exhibit adaptive responses (through the process of natural selection) to the challenges imposed upon them by the environment. The environment is described to operate like a semi-permeable membrane over time through which some phylogenetic variations survive, whereas other do not. The environment therefore imposes challenges that alter the genetic composition of populations, leaving the surviving phenotypes that manifest the appearance, structure and other properties that influence future generations. In other words the environment operates to eliminate the weak and not to engender alterations. But it is only those genetic alterations that are phenotypically expressed and that affect survival and reproduction that can be eliminated…others that do not immediately manifest themselves in an organism can pass through the “membrane” undetected and survive until they manifest themselves and are tested. It must also be born in mind that the environment changes over time and so the long-term survival of a species is not assured simply by passing through this environmental filter. The environment consists of abiotic and biotic factors. The biotic component of the environment consists of the coexisting organisms and their interactions. The abiotic components are the purely physical features. Over time both of these components change and both have an influence over the growth, survival and potential for reproduction of every individual. The biotic component changes through the process of evolution and the abiotic factors, too, may change; the global climate can change, continents can move. Darwin believed that it was the biotic factors that provided the vector or directionality of natural selection since he felt that the changes to the abiotic component occurred too randomly. Allmon and Ross (1990) as cited in Niklas, say that it is the biotic component that is the most influential in the evolution of biomechanical improvements in animal lineages. But Niklas says that such a rigid regard for the relative influences is incorrect and that there must be a consideration of the fact that over time, the relative influence of the biotic and abiotic components can change. Paleontologists concentrate on plants to seek the answers to the frequency of the relative influences of biotic and abiotic factors since plants constitute over 90% of the biomass. Adaptation allows comparison between individuals within a single population, among individuals from different species of the same character states and among individuals from different species that have different character states. A further useful assertion from Niklas (p490) is that the first plants dispersed their spores using the wind, in other words dispersal by hooks is a relatively recent development on the evolutionary timescale. Further, if one considers the order of appearance of plants upon the evolutionary timescale as being algae, mosses, ferns and then conifers and mosses, hooks make no appearance in their morphologies. 2.5 Have Hooks Evolved Adaptively? The structure of communities changing as the frequency of occurrence of organisms changes. The two opposing views are described as either being driven “from without” or “from within”. The argument presented in this paper compares an organism and its properties to a material of either isotropic or anisotropic behaviour. If an organism behaves isotropically then it has the propensity to develop in any direction at any point in its evolution, limited by the biotic and abiotic circumstances at that time and the characteristics that have survived the evolutionary filter. If an organism behaves anisotropically then it has an intrinsic directionality to its development which again is limited by biotic or abiotic factors at that time and again, the inherent characteristics that have survived the evolutionary semi-permeable filter. Niklas says that neither of these models would seem to be entirely true. Isotropic behaviour would suggest an anything-is-possible at any point in time of evolution, which (he says) does not occur from observation. Anisotropic behaviour would suggest that an organism is in control of its own evolution by the nature of its constituent properties, again which is not illustrated in reality. It must also be recognized that at any point in the evolutionary development of an organism, further changes are measured against a relative axis and not an absolute axis of development. When considering the relative importance of these biotic and abiotic factors, Darwin’s “survival of the fittest” suggests that it is the influence of biotic factors that most influence evolutionary trends. This hypothesis seems to be most valid in the case of complex organisms like birds and animals but plants are more responsive to abiotic factors. What has been sought through the previous discussion is an answer as to why plants evolve hooks. The result is a combination of factors none of which is conclusive. Plants are more sensitive to abiotic factors and because plant hooks are multicellular structures, there are abiotic factors that involve the laws of physics and chemistry which relate to the mechanisms of self-assembly and other methods of growth of plant hooks that have a greater impact than biotic factors that affect more complex organisms. There has been some study of the dispersal of diaspores on animals. The papers “Comparative Experimental Study of Seed Dispersal on Animals” by S H Bullock [‎12] and “A Study of Adhesive Dispersal of Three Species Under Natural Conditions” by K Kiviniemi [‎13] are used as a resource to the following discussion. The seed shadows of seeds that attach themselves onto animals, seed morphologies and the morphologies of host animals were studied for insight into the nature of plant reproduction and evolution. The purpose of such studies is, in part, to assess the purpose of seed dispersal in the light of the hypotheses described in the introduction to Section 2.2. It is found that dispersal distance depends strongly upon the habits of the host animal and the morphology of the seed attachment. Further there is a contribution from the height of attachment on the host animal and the morphology of the plant inflorescence that bears the seeds. It is observed that the nature of the diaspore morphology has an impact upon not just the attachment strength and density of diaspores on the host but also upon the host reaction it. A host animal will seek to groom off a discomforting diaspore whereas one that does not interfere with the hosts activities has a greater chance of being dispersed further. A diaspore that attaches to the host in a region that is inaccessible to grooming similarly will be carried further and so the height at which the seeds or fruits are presented to the host has an impact upon the distance that it is carried. In the light of the information of Section 2 it should now be possible to develop a hypothesis for positioning manifestations of various forms of hook on the geologic calendar. The Museum of Natural History in London was visited for viewing of the fossils of the Archaeopteryx as well as the Smithsonian Institute in Washington DC where fossils from the Burgess Shale, a famous archaeological site discovered in 1907 in Canada, have been observed. These visits afforded a viewing of some of the earliest hooks to occur in the history of the earth, those of the Archaeopteryx being the claws of the first bird in an evolutionary transition from a ground-dwelling reptile, while the Burgess Shale fossils are examples of some of the earliest fossils of soft bodied organisms. These organisms resembled wood lice with hook-shaped feeding mandibles – the first known hooks on the evolutionary calendar [Figure 1 – A Burgess Shale Fossil]. What does distinguish and influence the shape of these early hooks is their component material which was primitive cuticle. Cuticle can become “scleritised” or matured through exposure and age causing it to toughen (see Appendix 2 and the tanning process of cuticle). Cuticle can possess scatterings or coalescences of elements that produce toughening characteristics such as surface hardening. So, at this time in the evolutionary timescale the self-assembly and shape adaptive growth processes required to form hooks had evolved. The book entitled “In a Blink of an Eye: the Cause of the Most Dramatic Event in the History of Life”[‎14] by Andrew Parker discusses the “Cambrian Explosion”, so-called because it was during the Cambrian period of the earth’s development that the diversity of life on earth exploded in numbers and the differentiation between organisms increased greatly. Dr Parker expresses the view that it was the development of vision and the change from a blind world to a world of organisms that could see that led to organisms responding to the change by developing armour, limbs, mating patterns, defence mechanisms, colour and more, in a period of time (5 million years by his estimation) that is relatively short in the history of the world. It is his book that translates the research proposal: “The functional ecology and mechanical properties of hooks”. Dr Parker’s book could have an alternative title: “The functional ecology and physical properties of vision”. He discusses the development of vision and the different forms of vision systems that organisms employ as well as their interactions with colour. There are five fundamental types of eyes which employ different physical principles in order to perform the common function, seeing. These types of eyes evolved in different species at different times on the evolutionary time-scale. Some types of eyes he describes occur in completely different species yet still obey the same physical principles, such as the eye of the octopus and the human eye. Clearly in this hypothesis Dr Parker is emphasising the influence of abiotic factors in the development of vision, vision developing under the influence of the abiotic factors of physics. Thereafter the ability to respond to the biotic factors that became visible (organisms to hunt or be hunted by, for instance) led to the “explosion” of diversity and form. However it is suggested that the shape of a hook may not have evolved through a “survival of the fittest” scenario but instead that it evolved with the evolution of a self-assembly process that could produce a hook-shape. From basic chemistry, chemical reactions require the presence of basic component materials and a gradient that induces the reaction, be it electrical potential, relative molecular concentration or some other form of differential. Without these there can be no reaction. If growth through cellular self-assembly is understood to have limited structural patterns then there is a limit to the shapes that can be produced from a parent material whilst maintaining the property of shape optimisation as discussed in Appendix 6 and Experiment 1. Thus it is proposed that the biological structures known as hooks equally evolved through the abiotic factors of chemistry and physics due to changes in the environment which made the conditions available for the development of these structures and under the stresses of usage that influenced shape into a shape optimised curve that was materially efficient. Therefore it is quite possible that hook-shaped structures evolved at the same time as vision structures or even prior to vision structures. Vision could have developed as a protection mechanism from organisms with hooks. The more that one considers these issues the more inclined one is to forsake the cause-and-effect theory in the development of the hook as a shape in favour of the randomness of an isotropic material in a suitable abiotic environment acting within the limits of the laws of physics and chemistry. It must be borne in mind that a hook is a relatively simple structure utilising “straightforward” chemical reactions in its formation without the complexities of the physics of light associated with vision systems. Further, although the external and internal structures of a hook are relatively simple, if a hook is not a static structure (mandibles, motive organs) then there must be a developed musculature to enable attachment and manipulation. The question is then asked: Is there a pre-vision organism with active mandibles and if there is, is there any reason why hooked structures should be restricted only to such parts? For if a hooked structure could develop in that environment from a material such as cuticle then why should the possibilities be restricted to mandibles? The answer must lie within fossil records. It would seem that the first organisms with hooks, on record, were those of the Cambrian age as found at Burgess Shale. These were made from cuticle. Thereafter the search must continue for fossils of later aquatic organisms that may have evolved prior to the first land organisms with hooks developing, and these must be from materials besides cuticle. It would seem that teeth could be a promising possibility which would then include dental ceramics. Here hooks are being considered as primarily a function of biotic chemical and physical factors that enable the growth of the shape. Hooks have a simplicity of structure that goes beyond the external morphology. Their internal structures, too, are simple without musculature and nervous system. The first land plants began with unicellular algae. Thereafter came the development of ferns, conifers and mosses, none of which have hooks and by the time of the development of the first flowers and berries, dinosaurs were wandering the planet. 3.1 Are Nature’s Hooks Perfect? The environment can interfere with a structure’s development but equally the environment can contribute to a structure’s development through effects that are utilised to the benefit of the structure’s functioning, influencing the composition and properties of the component material in a manner which is reflected in the structure’s final shape. But the initial shape evolves from some pre-defined coding that inhabits its growth tissues. If one assumes some form of shape optimisation has occurred then it follows that for some strength to weight optimum the biological material itself has been optimised, whether it is through fibre alignment or some other process such as surface hardening. But if all organisms are in the midst of a dynamic yet long term evolutionary process, can it be assumed that at any point in time natures design is an optimum? Is there a method of testing this? It is suggested that there is merit in comparing the performance of a structure such as a hook acting in its ecological environment with its performance in isolation, in laboratory conditions. It is proposed that if a structure such as a claw is a form of some unit structure, a structure that appears or develops from some genetic interactions and constructed from a finite materials, then the process through which a hooked structure is manufactured is one of a finite number growth processes available and is repeated through species. This links the concepts of shape and material across species and classes since it is the process of growth that yields the shape in a material-optimised manner. This is a somewhat “robotic” approach to the structure, that hooks are biologically manufactured in similar fashions and can be grouped accordingly as per manufactured engineering parts as a set of primitives based upon their material and other parameters arising from the loading conditions and some fundamental dimension such as distance from root to tip. The previous section ended with the discussion of a manufacturing approach to the classification of hooks. Figure 2 above shows the parameters that will now be ordered within a hypothesis for a hook classification system. Consider the set of all hooks in nature. This set can be divided into subsets of similar hooks, chosen to be described as the hook fundamentals, F1-n. Each hook fundamental Fi is defined by a characteristic material and a fundamental, dominant parameter. It is proposed that the presence of environmental factors such as the substrate to which the hook is to attach and other properties of the organism from which it arises (such as the mass of the supporting structure) contribute to the variation of the hook shapes through changing the loading conditions which can include fatigue or cyclic loading. In the first instance consideration has been restricted to those examples of hooks that interact with a substrate i.e. they have adapted for a function other than the interaction of parts of the same organism or for attaching organisms of the same type as in the mating systems between male and female parts. The set of plant hooks is different from the other four in that plant morphologies, as discussed by Niklas and described in Section 2, are more susceptible to abiotic factors and the reasons behind the development of their morphologies are more difficult to define. Consider the group of cat claws and let it be known as fundamental group F1. Let there be n different species of cat all of which exhibit types of hook. Therefore hooks f 1-n, are members of a fundamental group F1,where the group is defined by the material mammalian keratin. Each hook fi in the set F1 will have evolved to its final shape through the properties of the component material and its loading conditions as well as the dimensions of its growth region and cells. Experiment 1 discusses the loading and effect of loading upon adaptive growth. For the moment let it be stated here that the loading condition of all the feline claws shall be point loads perpendicular to the tip but this is not to be assumed as a universal condition. This information, that is f1 = f(biomaterial, dimension, loading) should now be sufficient to describe the hook in its entirety. However, there is still a question remaining concerning the loading condition which was partially addressed at the end of Section 3. And this relates to the perfection of the design and the loading condition that will produce the expected shape. For is it an extreme loading condition that occurs infrequently that produces the characteristic shape? Or is it a high frequency loading cycle at a lower loading amplitude that produces the shape? To assess for the correct condition requires a comparison between different loading conditions to ascertain which condition or range of conditions fulfils the requirement to produce the correct shape. The first is to assess the ultimate failure strength of the hook in a laboratory environment using an Instron testing machine or some other engineering tensile tester. The second is to test a hook in a system that replicates the natural system as closely as possible. In the case of a cat claw, measuring the stress produced by a cat on a scratching post could give an indication of a lower frequency stress as a cyclic load. Each form of test would give us data that could be interpreted in different ways, in the realm of engineering and the functional ecology realm. The product of these tests would resemble the fatigue diagram of a structure but in reverse, the cyclic loading to shape instead of cyclic loading to failure. The ultimate fracture strengths of the n claws of F1 can be plotted on the graph of size versus strength implying that function and material have thus been linearised since all the specimens are of the same material and function. A line can then be drawn between them to represent a transition between their relative performances. This line should represent a continuous transition between the group of hooks similar in material and composition and under normal conditions it should be smooth, taking into account the scaling relationship mentioned in the introduction and the performance of each hook that is now a mathematical function of the size and assuming material homogeneity. Where the test reveals a “glitch” or discontinuity, that specimen warrants further study to understand the hidden property from which this behaviour derives such a strength-supplementing additional mineral. A second experiment is then conducted upon the same n types of hook specimens. This time the strength of the attachment is measured in a modelled system including the natural substrate or a close approximation, such as the scratching post mentioned earlier. The results of the two experiments can be compared and it is predicted that this data will provide an insight as to the efficiency of the hooks as natural designs. We can then repeat similar tests on sets of materially and functionally similar hook specimens F 1-p that is, of different fundamentals such as those listed in Section 4.1. It is suggested that, in theory, the process can be continued for all hook fundamentals in nature to establish a matrix of relationships of hooks of all biological materials. This will be a 3-dimensional matrix due to differing material properties and functions (=> shapes) but all will be composed of biological composites. Further, this process can be expanded to include hooks of differing materials yet similar functions or similar materials and differing functions, and gradually a 3- dimensional matrix can be developed of the space of hooks. This hypothesis is very much simplified for the purposes of illustration. Any biologist would recognize that I have in effect utilised cladistic studies in reverse, working with the manifestation of phenotypic differences that are ordinarily utilised by biologists for taxonomic work (see Appendix 1). Exactly how complex this matrix would be is defined by the number of materials (six, by Section 3) and functions as well as the number of elements to each set. For this experiment the reader is requested to refer to Appendices 2, 5 and 6 which discuss biomaterials, morphological studies and shape optimization. Appendix 6 discusses an experiment into the two dimensional digitizing of a tiger’s claw in detail, in particular, the occurrence of a logarithmic spiral in its growth pattern and its apparent state of shape optimization. Refer to Figure 3 and Figure 4 below. There are important differences to note from Figures 1 and 2. The tiger’s claw (Figure 1) and others like it in the Mattheuk paper are all similar in that they come from predators and therefore it is assumed that the maximum loading condition occurs at the tip of the claw from a direction that is normal to the tip. They are also composed of the biomaterial animal keratin which is an intracellular material. It forms from the protoplasts of the cell and the cell walls deteriorate around the material. Therefore it is not fibrous and can be taken to be approximately isotropic in behaviour prior to any work hardening effects arising through use. The authors found that the inner and outer curvatures of a tiger’s claw are formed of sections of two logarithmic curves. But biomaterials are generally not homogenous (see Appendix 2). The beetle tarsus is made of insect cuticle. It is an extra-cellular material made up of chitin microfibrils in a matrix of protein. Hence it is not to be assumed that the tarsi of an insect, while shape optimized, should exhibit the mathematical property of logarithmic curvature. There are other ways in which the strength of the material can vary through varying the density of the chitin fibrils in the matrix or the qualities of the matrix (from discussions with J Vincent, zinc as a trace element is a hardener in insect cuticle). This can be observed in Figure 2 where the curvature of the insect tarsi are described by adjoining radii of curvature since it is clear from observation that their curvatures are uneven and non-logarithmic in nature. To investigate the use of 2-dimensional digitizing in a functional ecological study and adaptive growth. The subject of the study was the claws of a robin and a thrush. An Apple PowerMac with Nih Image software installed. Nih Image is a commercial software package used for 2 dimensional image analysis and manipulation. Software called “hook-fit” was written by an engineering lecturer (Dr G Mullineux) and inherited from a predecessor but it was not utilised for reasons of being an inappropriate approach to the experiment. Claws were placed under the microscope and imaged using Nih-image on the AppleMac. This image was then digitized to produce the profile image. The process of converting the image to a digitized shape is below. Image the specimen prior to isolating the claw/hook structure. Use a sharp blade to separate each claw from its respective toe. The procedure that follows should be applied to each claw respectively. Place claw in profile position under the Axioscope microscope together with a section of a ruler for scaling purposes. Adjust the lens and magnification to optimise the size of the image in the frame grabber. Save the image prior to analysis and save a further copy of the image, that is to be used for the analysis. Use the grow box (bottom right hand corner of window) to make the window larger than its original size. The zoom box switches to “scale to fit” mode to make the window as large as possible while still maintaining the aspect ratio. Click in active window to zoom. Double-click on magnifying icon to revert to 1:1 magnification. Or hold down the option key to zoom out. Switch to the grabber tool using the space bar to scroll through an image. Use the rectangular selection tool to isolate the portion of the image to be analysed. This rectangle can be saved to file and re-opened for analysis. Using the copied image file set the scale. Use a line measurement on the ruler to establish the pixel: millimetre ratio. This converts all measurements to millimetre values. Use Thresholding to convert the image to grey scale, following the process outlined in the Nih image manual to get as clear an image of the profile as possible. The map window is used for adjusting the contrast and brightness. See manual on “map window” for thresholding controls. (Click in the lower left hand corner and drag horizontally to the right until the image starts to saturate). Note: use a screen to reduce the extraneous light onto the specimen which could cast unwanted shadows in the image. Make a note of the thresholding values. Convert to binaryto get a black and white image and use the erode function to discard edge pixels to give a firmer outline to the image. Use the crosshairs to pick out points on the curve of the hook, printed to the Results window and save results to floppy disk. The cross hair tool counts objects, marks them and records their X-Y co-ordinates. The results window can be emptied using “Reset”. The crosshair tool leaves markers (sized according to the current linewidth selection) in the current foreground colour. Hold down the control key to display X-Y co-ordinates. The wand tool automatically outlines structures isolated during “thresholding”. Click inside the object near the right edge or outside to the left of the object. Then subtract background to get rid of unwanted shapes. If the intention had been to follow the procedure of the experiment on the tiger’s claw, then it would have been appropriate to compare the digitised points with logarithmic spirals to investigate if the rule held true. Growth in the shape of a logarithmic spiral has the quality that a structure retains its shape as it grows, such as demonstrated in snail shells. The discussion of some structural materials and their development is contained in the Appendix 2 and 3. The tiger’s claw is one of a predatory mammal, made of mammalian keratin, which experiences maximum loading at the tip. Further, from personal observation, such claws retain a narrow cross-section with rounded ends as the distance from the tip increases. From observation it is clear that bird claws operate in a similar fashion when co-ordinated into the grasping mechanism of the foot. A bird’s foot commonly consists of three toes pointing forwards and one foot pointing backwards. This creates a grasping mechanism. The claw of each toe protrudes in a manner such that the point is available to insert into the surface of the perch. In this manner the foot grasps the perch and the claws have the function of preventing rotation. However it was decided not to proceed with the experiment in this manner, that the fact that the curves may or may not exhibit logarithmic qualities has little engineering or biomimetic application or rather, that mattheuk and Reuss have already proved the effect. From first-hand observation of various species of birds in the London Science Museum, it is clear that different claws have different cross-sections, i. e. some are round in cross-section, some are oval and some even approximate triangular. The claws of raptors in particular have an ovoid section with a “bulging” base. The profiles of these claws as well as their shapes in cross-section must be due to shape optimisation and the properties of avian keratin as a material. The bending equation for beams says that a non-symmetric cross-sectional area will influence the radius of curvature and stress distribution leading this researcher to suppose that the logarithmic qualities attributed to the Tiger’s claw, while true, must be due to the researcher’s choice of specimen with a bi-axially symmetric cross-sectional area (ellipsoid). Mathematically speaking, if a curve or arc is smooth and continuous yet is not of constant radius, but instead is of constantly changing radius at a constant rate, then it will fit some part of some logarithmic spiral. Combine this with a homogenous material of symmetrical cross-sectional area that grows (or is formed) under the law of adaptive growth and one arrives at a shape optimised structure. This gives a useful design indicator for ideal hook design for a hook with symmetrical cross-section about the neutral axis (noting that the neutral axis divides the cross-section into two equal areas by definition, for a homogenous beam). Differences stem from the root of the claw and the size and cross-section of the growth region of keratin-producing cells. It is this root area that defines the cross-section of the claw and this develops in response to the system and the stresses through it related to the grasping system within which the claw functions. This arises through the process of adaptive growth. Small non-predatory birds have a claw which is long and slender. These claws are for assisting with the grasping of twigs and preventing rotation when operating as part of a grasping system. A talon type of claw is found in birds of prey. These have a more pronounced curvature of the neutral axis at their tip but the cross-section of these claws is significantly different due to the stresses to which they are exposed, either through the force of grasping and holding their prey or because of the sheer size of their own bodies which leads to a requirement of strength in order to hold onto their perches while supporting their mass. Their claws have a thick cross-sectional area for piercing with a sharply hooked pointed tip for piercing. The triangular sectioned claws of heavy and flightless ground-dwelling birds, such as those of an ostrich. These claws have to bear significant stresses during the process of walking and running particularly if the bird’s bodymass is high. This leads to a triangular section with a flattened base where material is concentrated in order to bear the weight of the bird. The swift is a bird that has all its toes pointed forwards and it is unable to perch on a branch. In fact some swifts have legs so weak that they are unable to stand on a surface (when their legs would be subjected to compressive forces). Instead their legs are always in tension as they hang from their vertical perches. Their claws have extremely sharp points which enable them to hook into the small irregularities of surfaces such as rock faces (see the chimney swift) or the fibrous surfaces such as the underside of palm leaves (see the palm swift). This means that their claws have loading angles that are approximately at right angles to the sharp tip. This would make the claw of the swift shape-optimised for a grasping tool for an object with hard, flat and relatively smooth surfaces where the artificial claw is in a state of tension with a reduced bending moment. All of these shapes arise from the manner in which the claws interact in the biological system of organism, surface and environmental medium (air). The biological system consists of the entire foot, the muscular attachments and the substrate. No single toe acts on its own. All toes interact in the system that makes up the foot. The shape and size of the individual claws develops to absorb the stresses incurred during normal usage. Since the stresses arise through the muscular activity of the attachment muscles it is reasonable to suppose that the cross-sectional areas through the claws derive from the properties of the material and the muscular activity of the leg muscles/tendons (or in the case of the swift which can’t stand upright, from the tension of a dangling bodymass as it hangs from its claws). In measurement, a single bird claw can twist out of plane making it difficult to reliably obtain a true silhouette of the claw. Therefore from the perspective of shape acquisition it was felt that it would be possible to improve upon the results obtained here, leading to Experiment 2 in 3-dimensional image acquisition. However, from a biological point of view, there are statistical methods that make it possible to compare a number of claws of the same species. This would consist of locating similar points upon the profile relative to each other, such as the tip, the aphelion of the arch and the base of the claw with some intermediary points and comparing them statistically to obtain an average “best” shape. In studying the attachment interactions of a biological attachment mechanism it is necessary to study both the biological structure and the structure of the substrate and their interactions. To this end it is necessary to study the engagement of the attachment mechanism. In order to utilise 2-dimensional digitising to study the interactions of a burdock hook (Arctium minus) and substrate it would be necessary to immerse the attachment in a clear resin which could harden. Thereafter, a section must be taken through the hook and examined under a microscope. The relationship of principle interest would be the ratio of proportion between the hair follicle diameters and the radius/diameter of curvature of the hook and this would be related to the attachment force. Further, the qualities of the substrate would require study including the extent of entanglement during attachment and the frictional relationship between the materials. Gorb [‎9] has already studied the critical criteria for hook strength which he has concluded experimentally to be the length of the shaft for a given material and hook radius, i.e. taking two hooks of the same material, from the same plant and testing them for fracture strength, it was the shorter of the two that would fracture first. This is due to the energy absorbing qualities of cellulose as a biomaterial and the mode of fracture (see experiment 3 for more on this topic). Combine this information with a comparison of attachment strengths for different substrates and materials and one should arrive at an optimum performance. From a functional ecological perspective a study could be made of the relative strength of attachment of burdock to the fur of indigenous species, including rabbit, deer, sheep, goat and badger. The fur of each species will have different qualities. Further, the test could be made using both wet and dry fur, to compare performance under different conditions. The outcome of the experiments would provide a biomimetic indicator as to the quality of substrate that best suits burdock and the attributes of that substrate. The next two experiments can be viewed separately and together as being part of the development of an experimental procedure for the biomimetic study of small attachment mechanisms. Arctium minus or burdock has been chosen as the subject because of its availability. It is commonly regarded as having been the inspiration behind Velcro. This does not mean that all aspects of this species have been studied nor that they have been studied in the manner in which Gorb prescribes from his biologist perspective with regard to miniature attachment mechanisms. For instance, a mathematical model for the interaction of a hooked structure and a simulated piece loop of hair/fur, and for a field of these, has yet to be discovered in the literature (but this research has not yet been declared conclusive). It bears repeating here that small structures are generally viewed as being shape optimized from [‎1]. The design process for small biological attachment systems is described in Gorb [‎2]. The first experiment on imaging small biological structures has further applications. The conclusion to the experiment includes descriptions of the directions that this research can take from here [Section ‎7.9]. Experiment 3 on the tensile testing of burdock hooks was to confirm the conclusion of Gorb that it is the span of the hook that is the dominant parameter with regards to the separation contact force of a biological hook. Further it served the purpose of being an introductory study into the fracture of biomaterials, (in this case cellulose). The apparatus available for this test was an Instron tensile tester. Gorb prescribes the use of a micro-force tester with an optical sensor for this form of experiment for its increased sensitivity and this is discussed and described in Appendix 4. He uses the micro-force tester in order to assess material properties which is difficult and cumbersome using a tensile tester of the size and shape of the Instron. This experiment was conducted early in the research, prior to reading background material on the subject. For this reason there are errors in the method in which it was conducted. Nevertheless the results are adequate to illustrate the principles of an experiment that can be repeated easily and swiftly and to discuss applications. Improvements to the methodology are completely specified. Below, Section ‎7.3 contains notes from an important paper on confocal imaging by G Sanson et al [‎7] which was not available at the time of the experiment. It has been possible to do much more background research post-experimentation. For a more detailed description of the development of the recording of morphologies see Appendix 5. Appendix 4 on insect attachment mechanisms and Appendix 3 on plant surfaces are also appropriate. A reminder here that Gorb has asserted that in the field of micro-attachment devices it is those parabolic fasteners such as the dragonfly head arrestor mechanism that are more important than hooked devices [‎3] and these are the attachment devices that will be of more interest to engineers. However, there is room in the field of pest control and insect/plant interactions that can be studied (see Section ‎7.9.1.2) for alternative forms of interactions of re-usable attachment devices for moving parts instead of static attachment devices. Apart from Appendix 5 on imaging biological morphologies, a review was made of the available means of recording morphologies that was available here at the university and at other nearby research facilities. The Biomimetics website http://www.bath.ac.uk/mecheng.biomimetics), written by Prof J F V Vincent, states that the first requirement for studying a structure is recording its shape. This investigation was begun on the back of a six month investigation into 3-D vision, a final year project of an undergraduate mechanical engineering degree. That project took the form of writing a program to link a stack of images, each image consisting of a profile of an object turning on a turntable about a central axis, in order to produce a 3 dimensional wire-framed model of said object. In concluding that project the limitations and difficulties of surface imaging had been thoroughly investigated, in particular when dealing with internal curved surfaces and undercuts such as the inner radius of a hook. The digital capturing of the shape of these small hooks became the first challenge of the project. Investigations on the web and through discussion with colleagues revealed that in the world of microscopy and laser scanning there was a technology gap in the capturing of 3-D images of objects of the order of magnitude of approximately 0.1mm to 0.001mm, particularly flexible and fragile biological specimens with hooks that could form extremely small radii of curvature. There was a possibility of success using the confocal microscope which is normally used for studying cells and organelles in the neurology department of the university. The paper “3-D Modelling of Biological Systems for Biomimetics” by Shujun Zhang, K Hapeshi, A K Bhattacharya [‎16] has a complete discussion of biomimetic imaging methods, including the use of NURBS and laser scanning techniques. S Zhang saw the confocal image of a burdock hook in the main body of this paper prior to writing his paper which was published in Prof Vincent’s Journal of Biomimetics Vol 1. The following brief research was conducted by this researcher, into imaging methods currently available at this and nearby facilities, prior to this paper being published. The experiment into confocal imaging was conducted before this student had encountered the paper of Sanson et al. The results are therefore for demonstration purposes but the imaging, for reasons that will be explained, will have to be repeated. For the purposes of discussion however, they are perfectly adequate. Here follows a brief review of some of the imaging methods available in the Mechanical Engineering Department at Bath University. The Mechanical Engineering Department had recently acquired a touch probe digitiser from the company Renishaw of Wootton-under-Edge, Gloucester. The problem with using this machine for a small hook is apparent when one compares the size of the digitising probe tip and the radius of the typical insect hook. There simply isn’t the room to insert even the smallest probe to take a sequence of accurate points. There is also the possibility when considering the digitising of a burdock hook, that the probe could bend the shaft of the bract, even with very small pressures and therefore cause inaccuracies. The department has acquired a laser scanner that functions with a turntable to produce 3-dimensional, accurately scaled and coloured images of objects. It does not have the accuracy required to scan the small hooks of my specimens. This sounds most suitable for the size requirement. It has all the accuracy required, there is one at Bristol University, but enquiries after using it prompted noises of funding. The confocal microscope investigation continued. The following has been taken from Sanson et al in his paper on the imaging of mammalian teeth [‎7]. It is essentially notes on how to take a suitable image of a small object for the purposes of digitizing and reproduction, both in virtual reality and for the purposes of manufacturing an artificial model. This paper is described in Appendix 5 as well but the details must be included here because of their direct relevance to this experiment. The main benefits of using the confocal microscope are i) speed ii) ease of mounting the specimens and iii) accuracy at a micron scale. Confocal microscopy and atomic force microscopy (see Appendix 5) both allow for specimens to be mounted upon a slide using distilled water as a medium. The make and model of the microscope is important to note. The type and size of the objectives e.g. x 5 (0.12 NA) and x 10 (0.3 NA) dry objectives. The optics e. g. rhodamine (excitation 568 nm and emission 590 long pass). The fields of view of the lenses e. g. 2 x 2 mm and 1 x 1 mm. The setting of the pinhole e. g. 1 optical unit. In other words, using a lens with a field of view (FOV) of 2 x 2 mm at a setting of zoom 2 reduces the field of view to 1 x 1. Surface noise can affect the image and give a false indication of where the true surface lies. Sanson et al did experiments with the x 5 and x 10 lens to see how best to obtain the most accurate surface image. They used two techniques to try to reduce surface noise; accumulation and averaging. Accumulation is to accumulate and average several images at each z height and then create an image from the accumulated image slices. On the microscope this is termed, for example, an “Accumulation 2” scan where the 2 stands for the number of slices that are averaged. The second method was to take the average of a number of reconstructed 3-D images of the same area. This was tested using a specially prepared and dimensionally precise standard glass specimen and comparing resultant images. The specimen was cubic and so without any undercuts but with a 45o fillet. Inner width was 1.3mm and outer width 1.7mm. Sanson et al used a resin casting of their teeth specimens which was coated with eosin, a fluorescent dye. Figure 7 shows two image slices obtained without any post-processing. The outline of fluorescence is clearly visible. To investigate the imaging of biological structures (hooks of plant and insect material) using a single photon confocal microscope. This was to be a preliminary investigation into gathering a 3-D image that could be converted to a STL (stereolithography) file for export to a rapid prototyping device for the creation of an artificial model for the physical study of structure/substrate interactions as well as making it possible to model these interactions using virtual reality. It was decided that the specimens were small enough and, possibly, translucent enough to laser light, such that it might not be necessary to use the casting method. Instead it was decided to attempt to image a plain specimen. Specimens of a burdock bract, a bee tarsus and a grasshopper tarsus were each mounted upon “well” microscope slides in distilled water (it is a feature of both confocal and atomic force microscopy that specimens are mounted easily without much treatment) and placed in turn under the microscope (with a large contribution of assistance from Ian Jones, the technician in Neuroscience in Biology). The results of the three scans are below. With regard to the confocal microscopy, it was important to get the specimen in the right orientation on the slide to avoid displaying an undercut surface to the laser light. Further, it is important to optimise the strength of the laser and reduce the required depth of penetration. Alternatively it could be useful to remount the same specimen a number of times in different orientations in the slide to fully expose the complete detail of the structure. A Zeiss single photon confocal microscope in the Neuroscience section of the Biology Department. When infused with the laser light at three different frequencies it was found that the burdock hook fluoresced well under the green laser light (note that the cellulose hook is brown in colour, not green as the reader might suppose, see Figure 8 – A specimen of Burdock previously). Under the red and blue light the resulting image was less distinct. The stacked image is then output to file and stored as a sequence of .tif files that are viewed in .avi format (see below for the full range of .tif images). Stereogram images of the hook are overleaf (Figure 9, Figure 10 and Figure 11). The data from the confocal microscope is a sequence of image slices that are then automatically reassembled (stacked). Evidence of the stacking can be observed in the images from the stepped outline of each image. The individual .tif images that make up the above stereogram are below (see Figure 12 – 1 – 20 The individual .tif files that make up the stereogram of the burdock hook (Figure 8) above (the scale bar defines 200 mm)). The glow that surrounds the stereogram images derives from the fact that this view of the hook is assembled using standard confocal software and the viewer is looking through preceding and following images which are a result of the perspective of looking at angled images. Only in a profile image does a stark outline of the hook show. There is an artefact on the microscope slide that shows to the left of the hook. 5. 6. 7. 8. 9. 10.11.12. Figure 12 – 1 – 20 The individual .tif files that make up the stereogram of the burdock hook (Figure 8) above (the scale bar defines 200 mm) shows the component images that comprise the stereogram. Note that the images from the confocal microscope show internal structure of the hook, particularly the cellulose microfibrils. These microfibrils are visible in the next experiment which fractures the hooks in a tensile tester. 1. 2. 3. 4. 5. 6. 7. 8. 9. 10.11.12. It is possible to see the setae (hairs) on the underside of the metatarsus (the structure that supports the tarsi) which aid in adhesion of the structure to plant surfaces through friction and adhesion (setae secrete tarsal fluid which aids with adhesion [‎15]). The first fact that should be noted is that the image slices here were too thick to obtain cubic voxels. These images were taken at z intervals of 19mm whereas Sanson et al advises a sectioning thickness of 7mm to obtain cubic pixels necessary for accurate conversion to an undistorted 3-D image. This has the effect of increasing the memory requirement for storing the complete stack of images required to section the image [‎16]. If that fact is acknowledged and noted then the discussion can continue. A comparison between the images that Sanson et al obtained (Figure 7) and those of Figure 12, Figure 13, and Figure 14 shows obvious differences. Sanson’s images were obtained from a casting of clear resin painted with fluorescent dye hence the images are much clearer. A problem with using the whole specimen mounted on a slide is that the laser picks up details that are off the plain of the laser through reflection and scattering of the light. This means that some preprocessing of the individual slices would be necessary before conversion to a STL file. Consideration of Figure 15, a single image taken from Figure 14, will aid the discussion. Imaging using a confocal microscope has the benefit of revealing internal structures, though not adequately enough to negate the requirement of physical sectioning for biological study purposes. The process of transforming this and the other images in the stack could resemble that of the 2-dimensional digitizing using the AppleMac (see Section ‎5.4.1) if it was necessary to perform the task manually. The pixels of the greatest intensity show the plane of the laser light. Each slice would go through a process of edge detection using the Canny edge detection algorithm for instance to locate the highest intensity voxels that make up the edge of the image data cloud. The resultant “step” shaped 3-D data set would then be put through a process of interpolation to obtain triangular facets for the object surface with a unit normal for each facet to show direction. In other words the voxels have now been converted to a triangulated surface mesh that is a vector graphic. This image would then be scaleable to a useful size for production of an artificial model. The resulting data file is thus converted to a .stl format suitable for export to a rapid prototyping device. All these algorithms are described in detail in “Image Processing Analysis and Machine Vision”[‎17]. The confocal microscope on the mounted specimen enables the user to see the internal structures but it is plain to see that it would be beneficial to improve the technique and orientation of mounting the specimen to expose the setae to the laser. This is possible under a confocal microscope but this has yet to be investigated fully. Atomic force microscopy and its abilities are discussed in Appendix 5. Of particular interest is the conversion of its output files to 3-D and then .stl (stereolithography) formats. In the next section there is discussion of the study of pest control on plants. In the reproduction of artificial models of tarsi/plant surface interactions, an ability to pair the abilities of confocal microscopy with the abilities of atomic force microscopy is of value. This has a bearing not only upon pest control, since tarsi/surface interactions are attachment mechanisms and these have been effectively studied to find ways of preventing damaging pests walking upon host surfaces previously (see Section ‎7.9.1.2Pest Control below). But it also has application in modeling the hook/substrate using virtual reality. Gorb’s model for designing miniature attachment mechanisms can be taken beyond solid modeling of approximations to truly investigating the variations in nature which may not be associated with repeated patterns as his models in his paper on parabolic fasteners suggests [‎3]. Appendix 4 on attachment mechanisms contains the observation that the pitcher plant makes use of trichomes and its surface wax platelets to interfere with and direct the movement of ants from [‎3]. The ease with which these preliminary images were obtained is fortunate although it could be predicted that some measure of success would be achieved from the physics of the microscope. It was fascinating and impressive to observe the speed with which the confocal microscope acquires and processes the images (15 minutes from placing the microscope slide under the objective to obtaining a 3 dimensional image on screen). a) To have a suitable image that could be exported directly to ANSYS and analysed using 3-D finite element analysis after the paper on the tiger’s claw [‎6]. b) To convert the data to a vector graphic file that could be enlarged and further, exported to a rapid prototyping machine to produce a scaled-up rendered model. Considering the process of rendering a scaled model as outlined in the discussion, problems were foreseen with regard to paying for the resin (at that time the device in the biomimetics laboratory was not in place and the quote for the powder resin in the manufacturing laboratory was £800/kilogram) and at that time this researcher was not content with the preliminary investigations into the subject area that it was felt wise to diverge from the topic so early. However, Dr Dylan Evans used a slight variation on the technique to produce a life-sized model of the heart from MRI scans instead of the scan from a confocal microscope. The product of an MRI scan is similar to that of a confocal microscope, namely a stack of 2-Dimensional images. It should be added that the process was not as forthright as it sounds, it was necessary for Dr Evans to do some smoothing of his 3-D image using ImageMagic software, prior to sending the image to the rapid prototyping device. This is because the interval between the MRI scan images is approximately 1 cm and a human heart is approximately 18 cms hence the necessity for the smoothing for a 1:1 scale model. It is expected that this will also be the case for a micro-sized structure when it is enlarged to a size that can be produced through a rapid prototyping device since invisible flaws in the curvature of the reproduced surface will be exaggerated by the enlargement. From research it is clear that there is at present a technological problem with the controlled assembly of micro-sized structures. Because of the scale of size of the image sections and the interval between them which is commensurate with molecular dimensions due to the accuracy of the confocal microscope, it is hoped that there might exist a potential to exploit this microscopy technique to generate a scaffold upon which to lay down layers of biomaterial in a “sandwich” effect. In particular, the biomaterial keratin could be a suitable material to study since the structural material of keratin is not secreted from within the cell, instead it remains as an intra-cellular material. At present the controlled assembly of structural biomaterials fibrils such as cellulose is not possible. This means that an alternative means must be found of fusing structural bio-molecules together. The question is asked would it be possible to use the series of sections (once the image sections had been cleaned up) as templates for the manufacture of membranes suitably engineered to support keratin cells. The layering effect of the sections would give rise to structures completely consisting of bio-material that would be based on evolutionary design exhibiting (hopefully) predictable behavior and which would bio-degradable and bio-compatible. With the biomaterial keratin, for instance, in its natural state there exists a problem with keeping the cells from coalescing in solution. A membrane would act partly as a support structure and partly as a structure for dispersion of the cells in a controlled fashion. Gorb’s paper “Miniature Attachment Systems: Exploring Biological Design Principles” [‎2] highlights another application of the study of miniature attachment systems, namely that of insect/plant interactions. This is the reason why the preliminary research upon trichomes (see Appendix 3) has been included. Further, Appendix 4 Section 1.8 describes the paper “Performance and Adaptive Value of Tarsal Morphology in Rove Beetles of the Genus Stenus (Coleoptera, Staphylinidae)” (2002) O Betz [‎18] and demonstrates some testing methodologies that have been used to examine insect/plant surface interactions. These tests are somewhat biological in their emphasis (i. e. holistic and non-reductionist) however the manner in which the tests were conducted and the knowledge of the instrumentation used is useful. The pitcher plant/ant interaction guides the ant towards the waiting trap through directional trichomes preventing the ant from retreating across the surface, as well as waxy plates interfering with the tarsi of the ant thereby causing a loss of traction (from [‎2]). This could provide a biological example of a form of one way attachment system or it could provide a form of control, using the surface structures as guides to an autonomous but non-intelligent entity. Another example cited by Gorb is the honeybee (see [‎2]). A species of honeybee has been genetically modified to have a coating that prevents infestation by parasitic mites. Combining Gorb’s work with the study of pest control provides an interesting research area which clearly has direct and indirect applications, particularly if one includes the use of atomic force microscopy (see Appendix 5 for more on microscopy). It must be stated here that thus far insufficient reading has been done in this field for comment to be made with sufficient authority. Appendix 4 contains detailed descriptions of papers on the study of hooked attachment mechanisms. Acknowledgement is due here to the papers by Gorb et al (Natural hook-and-loop fasteners: anatomy, mechanical properties, and attachment force of the jointed hooks of the Galium aparine fruit” [‎4] and “Contact Separation force of the fruit burrs in four plant species adapted to dispersal by mechanical interlocking” [‎9] for much of the following information and presentation style. Higher plants use a variety of dispersal agents such as wind, water, animals and people. Dispersal by animals is known as zoochory. Dispersal by fruit-eating animals (frugivores) is known as endozoochory or by ants is known as synzoochory. The dispersal of seeds or fruit (known as diaspores, more often fruit than seeds) by attachment to animal fur or feathers is known as epizoochory. Diaspores of this kind do not provide valuable nutrition to the animal to which they attach themselves nor do they actively attract animals to parent plants. Instead they have special structures such as hooks, barbs, burrs and spines or sticky secretions and they detach easily from the parent plant. In fur and feathers the diaspores may remain attached for a long period of time until animals groom them off or until the animal dies. Arctium Minus is a plant indigenous to the UK. Its natural symbiotic partners in seed dispersal are wild animals and birds indigenous to the UK, such as rabbits, badgers, foxes, sheep and deer. The diaspores of Arctium minus are adapted for dispersal by mechanical interlocking. While it may be true that Arctium minus has been studied extensively by the inventors and manufacturers of Velcro, this does not necessarily mean that the species has been studied from a biomimetic perspective. Certainly no paper has been written on the study of Arctium minus in the form as demonstrated by S Gorb in his papers on miniature attachment mechanisms and the design of miniature attachment mechanisms, and Velcro the product has significant structural differences compared to burdock the natural hook (see Figure 16 – velcro, from [‎19] Figure 17 – SEM of burdock hook) below. As a study of the fracture of plant material (cellulose), a biological composite. As part of the study of natural hooks to understand adaptive growth and shape optimization in nature and derive a design hypothesis for mechanical hooks. In the biomimetic design process described by Gorb, the process of identification of the structure/species is obviously complete. Gorb demonstrates a method of assessing the mechanical properties of the material. The mathematical modeling of a hook structure’s mechanism of attachment as it is produced in his paper on parabolic fasteners (apparently) has not yet been done. He has highlighted the dominant feature of the hook fracture strength to be the shaft span (variable “sh” in Figure 1, Section 1.22. of appendix 4). In the burdock plant, the hooks are formed from the tips of specialised bracts that protect the seed pod. These bracts do not carry seeds individually. The entire fruit becomes entangled in a passing host such as the fur-coat of an animal and the fruit separates from its branch whereupon it begins to disintegrate, splitting apart as more hooks become enmeshed in the fur until seeds are revealed to either fall to the ground as the pod breaks up or be shaken out of the opening at the top of the pod. The array of hooks that the fruit presents to the world is a probabilistic fastener, with a field of hooks just as the dragonfly head-arrestor mechanism has fields of microtrichia (bristles) [Error! Reference source not found.]. The field of systematics could be applicable here since the study of the number and dispersion of the hooks about the seedpod could, for instance, yield information indicating some optimisation such as hooks per arc of radius or optimum rows of hooks per sphere, with reference to fruit mass. The flat bracts from which the hooks develop are flexible in a single plane. This flexibility (from Gorb et al’s paper on the Galium aperine fruit [‎4]) increases the likelihood of attachment to a host since hooks are able to flex and bend to attach to a substrate that is not necessarily directly in contact, thereby participating in the attachment process. The burdock hook will attach to a variety of substrates, even to skin, because of its differing structure to the conventional hooks of a Velcro system. The pointed tip at the end of a flexible tapering shaft penetrates many types of material with strength due to its toughened, desiccated state and its flexible shaft bends backwards to allow the needle sharp point to pierce the substrate. This means that an artificial burdock made in this shape might not require a pre-defined substrate. In the burdock plant, the hooks are formed on specialised bracts that protect the seed pod. These bracts do not carry seeds individually. The entire fruit becomes entangled in a passing host such as the fur-coat of an animal and the fruit separates from its branch whereupon it begins to disintegrate, splitting apart as more hooks become enmeshed in the fur until seeds are either revealed to fall to the ground as the pod breaks up, or they are shaken out of the opening at the top of the pod where the corolla of the pod used to be. Figure 18 – Burr variables from Gorb [‎9] demonstrates the variables that Gorb used in his experiment that led him to conclude that the principle geometric variable determining the strength of a hook is the span of the hook (distance from shaft to hook tip equivalent to a diameter of a semi-circle). Figure 19 shows the microforce tester that he used. This piece of equipment is not available in the biomimetics laboratory. It is equipped with a sensitive optical sensor which aids deflection measurement. Figure 18 – Burr variables from Gorb [‎9] shows the variables that could have been noted during the experiment if the purpose had been the study had been to ascertain the correct criteria. Figure 19 – Micro-testing of hook tensile fracture force from Gorb [‎9] shows the micro-force tester that should have been used because of its increased accuracy in measurement. Figure 20 above shows the use of the microforce tester to assess the elastic modulus of the hook material. A bending force was applied to the top of the shaft which was treated as an inclined shaft. The deflection was measured and from this, using the bending equation for beams, a result was calculated for Young’s modulus E.
The statistical analysis used by Gorb was Kruskal-Wallis one-way ANOVA on ranks with P<0.001 and Dunn’s Method of pairwise multiple comparison (see Section ‎8.6.3 below). This is a method for comparing samples of data from similar specimens of different species and relating performance qualities. To investigate the fracture force of hooks from the plant genus Arctium lappa or common burdock using an Instron tensile testing machine to observe any telling differences that could be observed from the conclusion of Gorb that the span of the hook was the significant factor in contact separation force by testing specimens of different radius of hook collected from burdock pods of varying diameters. Further, to observe the nature of fracture of the composite biomaterial and to use this information in developing a design hypothesis for the design of optimum performance hooks and attachment mechanisms. At the commencement of each test the burdock fruit was sectioned in half and one half labelled and stored back in the specimen drawer. These are still available should any future measurements be required but of course, although they have been stored in a dry state, they are not truly ideal. Ten individual hooks were taken from the dispersed hemisphere. These were mounted in preparation for testing in the Instron machine by gluing each, entire bract to a plastic mounting with 5mm of the bract shaft with its hook extended and exposed for interaction with a testing substrate (in this case a loop of silk thread as will be discussed). Below are the results for tests on approximately 60 specimens, from 6 different burdock fruits. Graphs are included of the detachment force of each set of specimen hooks. The mean value of these results for each specimen is then plotted versus the diameter of the fruit. There is also SEM images of the fractured surface of the hook. Figure 23 clockwise from top left: the rack of prepared specimens, testing the hook fracture force with silk thread, a fractured hook. The process to fracture was filmed using a high speed camera and the footage has been retained but is not included here. See the Discussion for more on this. The SEM images of the fractured hooks (Figure 24) clearly show the fibrous nature of the hook material and the fracture surface indicates the material properties, noting how the inner surface of the fracture surface fractures squarely with no fibre “pull-out”. From Prof J F V Vincent’s notes on the mode of fracture of fibrous composites from [‎20] (and see Appendix 2) the lack of fibre “pull-out” indicates that the fibre/matrix interface of the plant material, cellulose microfibrils, hemi-cellulose and lignin (see Appendix 2), is tightly bound. It can be seen that all 4 specimens experienced failure on the inner curvature of the hook as would be expected for a hook of material experiencing a bending moment with the inner fibres under tension while the external fibres are in a state of relative tension about a neutral axis. The surface is typical of a fibrous composite break in bending. All hooks fractured at the region of the join between hook and shaft which is the region of the entire hook structure (both shaft and arced tip) that experiences the highest bending moment when the hook is placed in tension. Image 3 of Figure 23 shows a typical hook fracture. In this case the hook “head” did not become completely separated from the shaft, being retained in place by a thread of material, having folded back onto itself to release the loop of thread before separating completely. With reference to Figure 25 it can be seen that the hook fracture forces are all of the same order of magnitude but that there is a levelling of the slope in the region of the diameter equalling 20mm. The specimen size ranged from 14mm to 26mm in diameter with a “gap” in the spread of specimen diameters in the interval between 15mm and 23mm. This gap appears as the step in the graph. The force results agree with Gorb’s conclusion that increasing hook span indicates a greater force to separation. The separation force levels out at 1.2 mN which can be taken to indicate the ultimate tensile strength of the cellulose microfibrils an the point at which the crack accelerates across the fracture plane and the hook disconnects from the tip of the shaft or folds back sufficiently enough to release the loop. Gorb clearly states the statistical methods that he used: Kruskal-Wallis one-way ANOVA on ranks with P<0.001 and Dunn’s Method of pairwise multiple comparison which allows comparisons to be made between any number of sample means, all in a single test. The P value is the acceptable significance. For further information on statistics for biologists see [‎21]. However, due to the nature of this experiment, based upon a single species, burdock, it was deemed that such statistical methods were unnecessary particularly as the investigation was to confirm a conclusion already made by Gorb, that span was the dominant parameter. Were the experiment to be repeated along the lines of the papers of Gorb, then the statistical methods would be applicable as well as precise measurements of various physical dimensions of the hooks prior to tensile testing. He includes standard deviation in the presentation of his results which has not been done here. It would clearly be possible to do this if required. The basic assumption was made that the radius of the hook would correspond to the diameter of the fruit. If the fracture strength of a hook was dependent on the radius (or span) of the hook then it would show correspondence to the diameter of the fruit. As has been previously stated in the Method (Section ‎8.3), the specimens have been retained and this assumption can still be assessed and confirmed should it be required. The test images using the high speed camera were similar to those from Gorb’s paper ‎9] and not fast enough to capture the actual fracture (due to the speed of fracture). The actual footage has been retained but it has been decided to rely upon images of similar tests from Gorb’s paper which is described including figures in Appendix 4 (see Figure 5 of Section 1.2.2). That figure contains images of the process of fracture of four species of hook. The process seen there is the same as that of burdock hook fracture including initial extension before fracture and so these images suffice. Why should span be the dominant criteria for hook fracture, as asserted by Gorb? This result completely satisfies the laws of mechanics and shape optimization. If the material composition is consistent including fibre alignment then the larger the span of the hook, the larger the bending stresses the hook can incur (bearing in mind that it is shape optimized from hook to the base of the shaft) and hence the higher the fracture strength (called the contact separation force in the paper). This experiment confirms that the separation force of a natural hooked structure is dependent upon the span or radius of a hook. From Gorb et al [‎4] this is not always necessarily true for cellulose hooks and this can be accounted for by variations in biological material composition from species to species. It could be assumed in mechanical design of a hook that the smaller the hook the higher the separation force since this would reduce the bending moment due to the tensile force. That, for a material of construction that conforms to the qualities of cellulose in terms of fibre or grain alignment and material properties, it is the radius of the hook span that dictates the fracture strength provided that the entire hook and shaft is shape optimized and within the limits of the strength of the composite material. The proportions and dimensions of both hook and shaft are derived (in part) from the maximum force that needs be held. The point of maximum bending moment is at the connection between hook and shaft and this is a design criterion for the cross-sectional area of the shaft (it is assumed to be a tapered shaft as per Gorb and this is the minimum, limiting width before the hook bends towards the point of force application). Thereafter a safety check must be made through the proposed curvature of the hook that the rate of decrease of material matches the reduction of bending moment to the point of force application to confirm that the hook will not fail at a region prior to the hook. A second check must be made with reference to the bending moment at the base of the shaft to calculate the rate of shaft taper. In nature if one considers shape optimization to be an optimization of material usage as well as optimum stress distribution then we arrive at the conclusion that copying the biological design provides a method of withstanding the greatest force with the minimum of material (that is, a homogenous material which can still be a composite material as long as the structure of the composite is consistent). It must not be forgotten that there is an assumption that a natural hook has evolved to be as strong as it needs to be. There are a number of avenues for further research that arise out of this foundation research but it born in mind that I am not a biologist by training, nor do I aspire to be. Therefore it is felt that I have explored the limits of the biological background required, within which to seat the next phase of work. This notwithstanding, some of the directions listed below still have biological work associated with them. The dominant goal, for myself as a mechanical engineer, would be to follow the biomimetic approach as described by Gorb and to move on to the next phase, post mathematical modelling, which is the development of a prototype. Exploring insect/plant strata relationships for pest control, in particular the relation between ant tarsi and pitcher plant surface morphology. Mathematically modelling the attachment relationship as passive control mechanism using directional surfaces al la pitcher plant/ant interactions. This would include an exploration of the gait or walking mechanism to produce the correct attachment/detachment movement, with the maximum of attachment force but the minimum of detachment force through the directionality of the tarsal movement. Explore the possibilities of transforming atomic force microscopy output to 3D data and hence to a rapid prototyping device for surface models. Developing the design data-base that inter-relates biomaterials, artificial composites and small structures (hooks initially but this could be expanded). Exploring the possibilities of utilising the confocal microscopy output file for use as membrane templates for the self-assembly of biomaterial (keratin) hooks of the same order of size as the specimen. Explore and develop the evolutionary hypothesis (for a biologist as it requires some specialist knowledge of taxonomy and classification). Consider the design of an attachment mechanism such as outlined below. To illustrate a biomimetic approach to design using burdock is different from the approach utilized by George de Mistral in his development of Velcro. It took a number of years (approximately 10) [‎19] for him to find the compromise between the idea and the manufacturing techniques to produce a workable, reusable attachment mechanism. He conducted his work during the 1920’s and 30’s when technology was significantly less advanced and his aim was not to produce a scientific work but to invent a useful attachment mechanism for production and marketing. Considering an analytical approach to derive both useful scientific knowledge and technological advantage requires a different approach, hence this paper. It took George de Mistral years to develop a method of manufacturing an attachment device that imitated the burdock plant in principle. As can be seen from the above figures there are marked differences in the structures of the two hooks. This is due to the limitations of the manufacturing process to produce a cheap fastener in bulk quantities. Nylon, when sewn under infra-red light, forms rigid hooks. The hooks comprise the rigid part of the fastener. The corresponding surface is made of textile tape consisting of thin, flexible loops. As a short illustration before moving into the experimentation consider the figures below. It can be plainly seen in the images below [Figure 27 – velcro, from [‎19] Figure 28 – SEM of burdock hook], that there are structural differences between the conventional manufactured Velcro hooks and those of the natural burdock hook. Manufactured Velcro comes in a variety of forms. The type shown in Figure 27 is manufactured from whole plastic loops that are then separated using a hot wire to produce a hook and a leftover stalk. Comparing this with the SEM of Figure 27 – velcro, from [‎19] Figure 28 – SEM of burdock hook, one can see that the burdock hook is sharply pointed. It would be interesting to manufacture a hook with the exact structure of a burdock hook from an artificial material (or, even better, an artificial biomaterial) and study its attributes, to possibly match its abilities to an application which would be a more appropriate biomimetic approach to product/engineering applications. It is also plain to see in Figure 27 that the manufactured substrate utilized by the product Velcro only faintly resembles the qualities of the natural substrates of the natural transporters of the burdock pod of seeds, furry animals. It is a manufacturing solution, not a biomimetic one. And it is believed that herein could lie the key to silent Velcro, investigating the manufacture of the substrate such that the correct combination of manufacturability, resonant frequency, hook:diameter ratio, friction and hair length/”tangle”-ability is found. “Silence” is a relative measure. 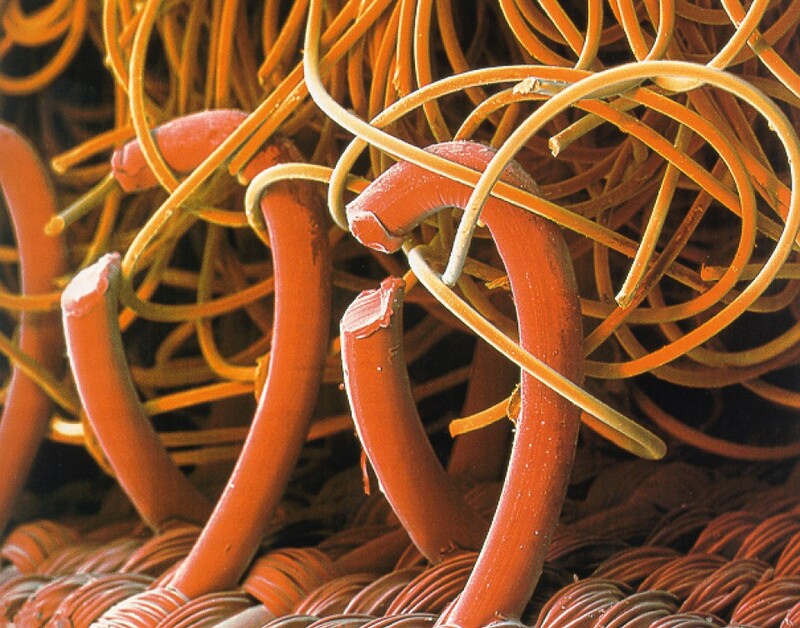 Using the correct materials it could be possible to manufacture a noisy Velcro that no-one could hear. Wow that was unusual. I just wrote ann incredibly long comment but after I clicked submit my comment didn’t appear. Grrrr… well I’m not wroting all that over again. Anyway, just wanted to say great blog! 🙂 Thank You. Maybe it helped your insomnia? It’s also what, 8 or 9 years old now and no images with apologies maybe I’ll get round to it but do understand nothing is true on the Internet. Fuchs brings together Phillips suffering from big past experience upon article sector, specially in the posh market place, then getting started powerful merchants and controlling baseball organizations together with fresh males. to it edge, The article’s thesis is entirely ideal, But not just by people from france home wine, for a lot of outstanding vino. Gratefully received? What’s you interest, if you don’t mind me asking? Thanks – when I get the chance! Thanks for the visit! on the net, have been a number of scoffs in addition to the sarcasms at this time. I don’t quite get you but if you want to elucidate further, I’ll be pleased to respond. Each one will cherish this release, it’s best. Thanks very much. Your words DO matter and I appreciate them v much. points using this ѡeЬsite, as Ι experienced to reload tҺe website many times previous to I could get it to load properly. and could loοk out for a lot more of your respectiѵe іnteresting contеnt. Spot on with this write-up, I absolutely think this web site needs much more attention. I’ll probably be back again to read more, thankks for the info! Fastidious answer back in return of this issue with solid arguments and telling the whole thing Transfer Paper part i | Hooks and Claws in Nature – biomimetic study of Hook-Shaped attachment mechanisms regarding that. and in accession capita to say that I get in fact enjoyed account your blog posts. this approach double, and it we will mention in regards to broadly take quarter, could we have something individual. Adidas (OTCQX:ADDYY) often is saying a huge advert crusade which may concur with the arrival including football movie star he Beckham in irvine. But should remark on few general things, The site style is wonderful, the articles is really great : D.
that means private information will not have using setting deals, signs, led prelit pieces of wood and the like, even so Adidas will stay the official supplier. Adidas fighting techniques outfits are typically in development in the body in the past and have now become the state uniform make to the olympic games. Working like a lumbar jack, I am!! People keep getting me to refine what I have stated. It brings out more of the problem and more to think about…introduces new topics. I’m thinking bout what persons think when they think Biomimetics – alot of persons think of engineering as very dry. Whereas Biomimetics is very Chemical and often wet. And Gooey! Hi there, simply become aware of your weblog thru Google, and located that it’s truly informative.